As well as manufacturing doors and doorsets we can supply, machine and factory fit ironmongery. We offer three standard ironmongery ranges. Each range is specifically designed for either residential, contract or architectural projects, with the cost and performance specification to match the intended use. We deal directly with the major architectural ironmongery manufacturers in the UK, including Dorma, Hoppe, Royd & Tucker, Carlisle Brass and Geze. We have built strong business relationships with these brands over the years and will maintain our commitment to only work with respected brands within the ironmongery industry. By supplying the complete doorset, including the ironmongery, we can ensure that all the components work together perfectly and most importantly that the fire certification is correct. Safety is always of the highest importance and consideration when manufacturing all our doors. 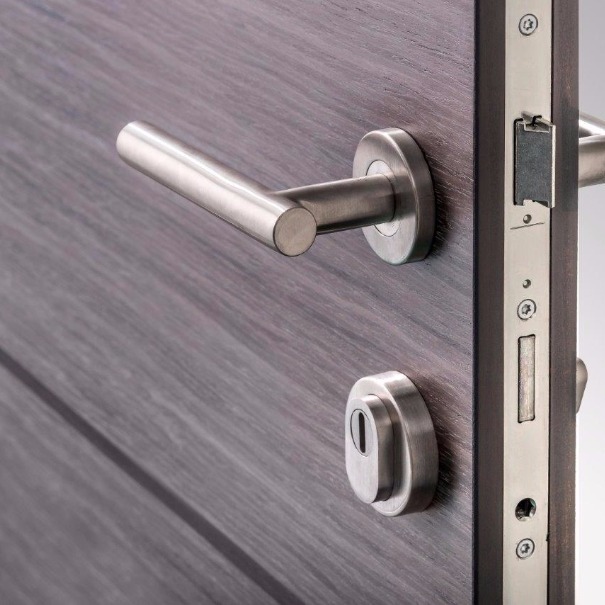 We believe a door and its ironmongery should always be sold together to ensure they fit together perfectly, as a pair – this is a particularly important consideration when it comes to fire doors. All ironmongery needs to be certified and compatible, otherwise it will not perform as effectively as it should. Doorpac can supply lock cases, lever handles, door closers, signage and kick plates, and master-keyed cylinder systems. Our standard ironmongery ranges are available in Satin Stainless Steel (SSS), Polished Stainless Steel (PSS) or Satin Anodised Aluminium (SAA). We can also offer various other finishes including Brass, Bronze, Nylon and Black Nickel. The majority of the doorsets we manufacture and supply are fire rated. As such, the ironmongery fitted to the doorset performs a critical part in the potentially life-saving role of each fire door. For this reason the ironmongery needs to be regularly inspected and maintained in accordance with the manufacturers’ instructions. To find out more information about our ironmongery and other products get in touch today!